Submitted by Zombiedude on December 23, 2009 - 3:12am. I'm like that, except with chips. Submitted by tyler tinsley on December 23, 2009 - 3:40am. so i guess the stress of holiday cooking leads to stress eating? deadly combination if ya ask me. LOVELY water colors btw! Submitted by omniwarrior on December 23, 2009 - 3:55am. Not gonna touch that... My wife has been doing something similar and now everyone thinks she is pregnant. She doesn't even have the guts to tell anyone otherwise. Submitted by kriztov on December 23, 2009 - 6:22am. @omniwarrior aren't you guys going to be in a pickle in 9 months? or the months leading up to then? Submitted by kriztov on December 23, 2009 - 6:23am. Submitted by 143scooter on December 23, 2009 - 6:29am. Haha.. I'm smiling when I read the posts here. And I agree, jam becomes jelly. Submitted by Ktrd on December 23, 2009 - 8:29am. Submitted by Sutokito on December 23, 2009 - 9:32am. Oh wow, I love your water colour comics. <3. Must be harder to make than your regular comics, I'm guessing. Submitted by casey on December 23, 2009 - 12:23pm. Submitted by bk-o on December 23, 2009 - 1:02pm. Looks like someone needs a visit from the "Fat Mugger"... (Today's Cyanide and Happiness). Submitted by Jam on December 23, 2009 - 1:39pm. Submitted by Ktrd on December 23, 2009 - 2:16pm. Submitted by MikeTheRipper12 on December 23, 2009 - 5:37pm. Hey Jammy, I has a question. Recently I started working with prisma colors, but I'm having a hard time getting the markers to blend nicely. Any hints you can throw at my face? Submitted by SpilledInkGuy on December 23, 2009 - 5:45pm. Submitted by deserthare on December 23, 2009 - 6:10pm. This is why my dad used to have to ration cookies... i would eat them until i puked. Submitted by lengeta on December 23, 2009 - 6:18pm. This is why women rock. I think we had over 8 batches here at one point. Submitted by 3.21.2009 on December 23, 2009 - 8:34pm. Just finished baking 150 cookies of 5 sorts and 40 cakes of 4 sorts. I think they will last a week, 2 at the most.P.S. I don't celebrate anything this time of year, except I just finished my finals for this semester.P.P.S the Biomolecular metabolism final sucked. Submitted by Xelmon on December 23, 2009 - 11:55pm. Aw come on, it can't be that bad! The extra, that is. The cookies, man that would be horrendous to bake. Submitted by Jam on December 24, 2009 - 10:04am. @Mike - I'm not quite sure what you mean. Markers won't blend like paint, and it's rarely an effect I'm after. Try to make sure you're putting down a solid layer (solid colour, not streaks), and think about 'layering' colours instead of blending them. Often I find that putting lighter colours on top of dark blends more, but it's not an effect that's easy to predict or control, and I don't really like it. Prisma also sells a colourless blender, but again it's not something that I use. Bright pastel colours blend best. Submitted by AlmostLiterally on December 24, 2009 - 1:07pm. Panel 1 is what my aunt's house looked like last night. She and my mother had a strip of wax paper lined along every inch of her counter space (And she has a lot of counter space, counters all along one huge wall, and then on two more long walls and then a ten foot island in the middle) and cookies just PILED on top of the wax paper. Hundreds of peanut butter and sugar cookies. Urf. Submitted by Ktrd on December 24, 2009 - 6:35pm. 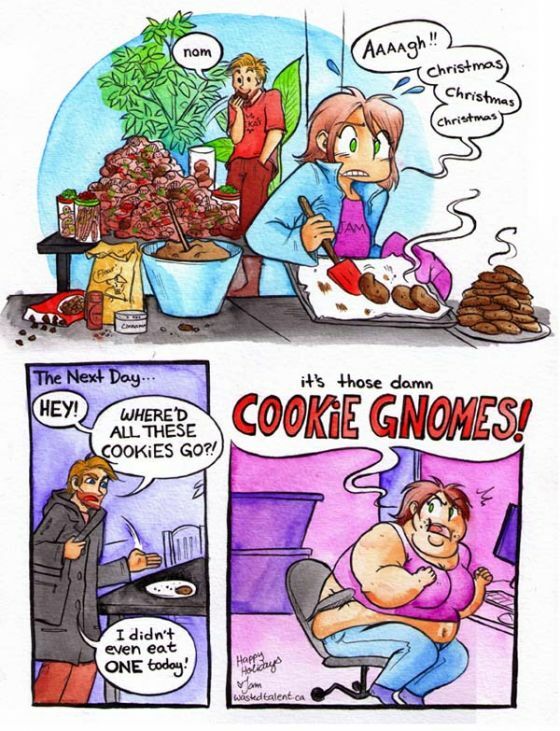 Hah, here in my house we have pie, instead of cookies... And instead of cookie gnomes, we have pie gnomes (a.k.a. me and my brother :f)... // I personally like colouring with color pencils ? ?_e, or maybe because i never painted with anything else... I often shave the pencil, and paint with the chips, in a smoky way, using my fingers... It's good to cover up large ? ?reas and easy to use light and shadow, just depends how strong you press the paper. Submitted by mrjams96 on December 25, 2009 - 1:22am. i accidentally finished off some of my moms cookies, so i decided to make a new batch...turns out these things take literally ALL FREAKING DAY!..never again. I'm going to have nightmares about fudge tonight. Submitted by kriztov on December 25, 2009 - 8:53am. My family kind of has the same thing, except its eggnog. I usually make it at christmas, and it's pretty potent. It's been joked that you could probably light fires with it. Submitted by shadeofred on December 27, 2009 - 4:34am. Hmm.... I would have thought it would be a cookie squirrel. And the squirrel might be poking its head in through a window or something. Submitted by s1rra on December 27, 2009 - 4:39am. Submitted by Anonymous on December 27, 2009 - 5:59pm. Submitted by Uzura on December 27, 2009 - 10:23pm. you could NOT have eaten ALL of those...! Submitted by mal4iu on December 30, 2009 - 7:07am. Why there no comic? ;_; Now what am I going to do at work? WORK?! Submitted by Bruceski on January 1, 2010 - 2:52am. Submitted by Ktrd on January 1, 2010 - 3:12pm.